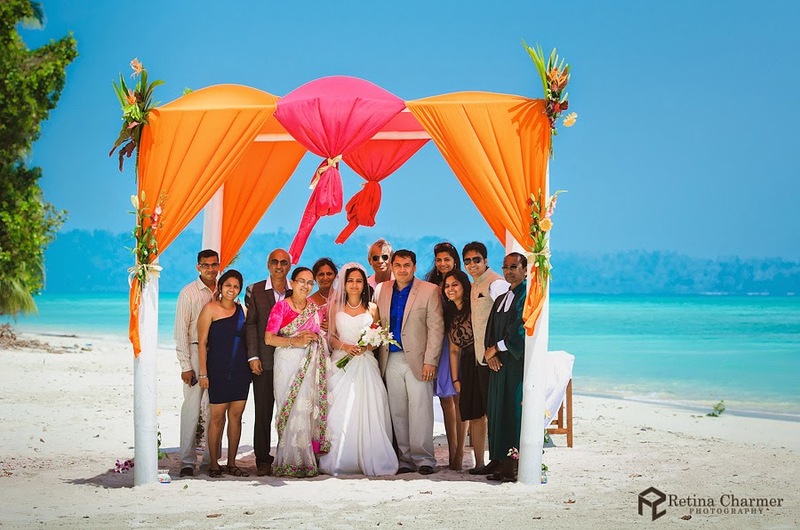 We have a short story of an exotic destination wedding for you today. 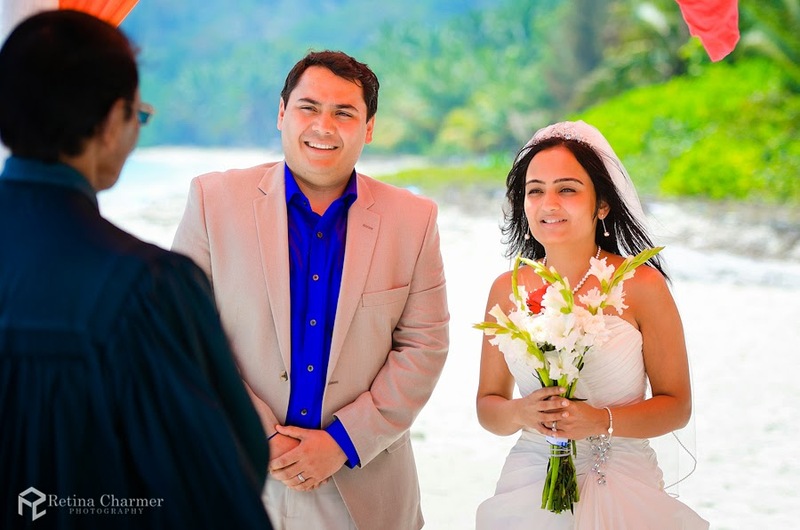 Yes, our own, Indian island wedding! I am so excited!! (I guess I have used all the exclamation marks for the month :D). This story is unique in more than two ways, first it is a destination wedding, second it took place at a unfrequented place and third it is a NRI story. This is Marisha and Neil's story, edited by me and captured in pictures by Navin Kumar of Retina Charmer Wedding Atelier. Before I begin the story I would like to apologize for a post a month, I really have great stories with me but I do not get time to edit and enhance them. I have my final exams in a week's time and so will be focusing on it. After that I am planning for a renovation of the site as well as a schedule so that I blog regularly. I think I have made enough excuses :P I promise I will do a better job! wedding took place in India. 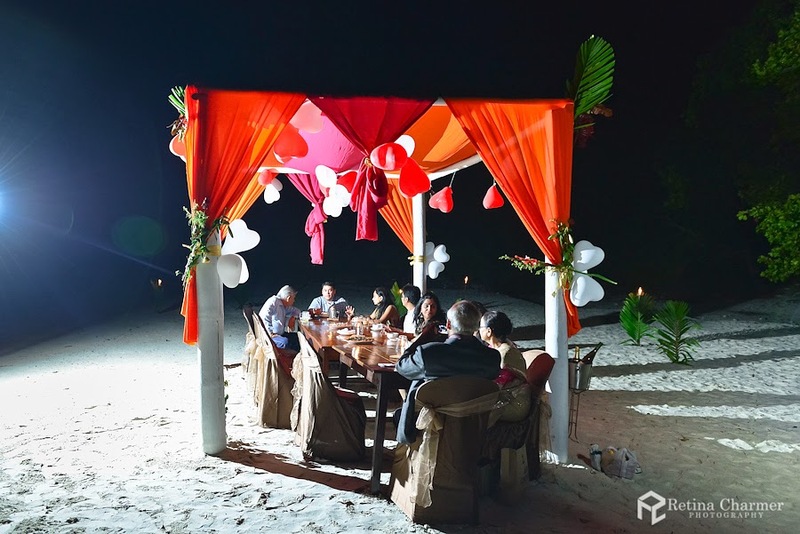 Take a wild guess: where in India was it held? 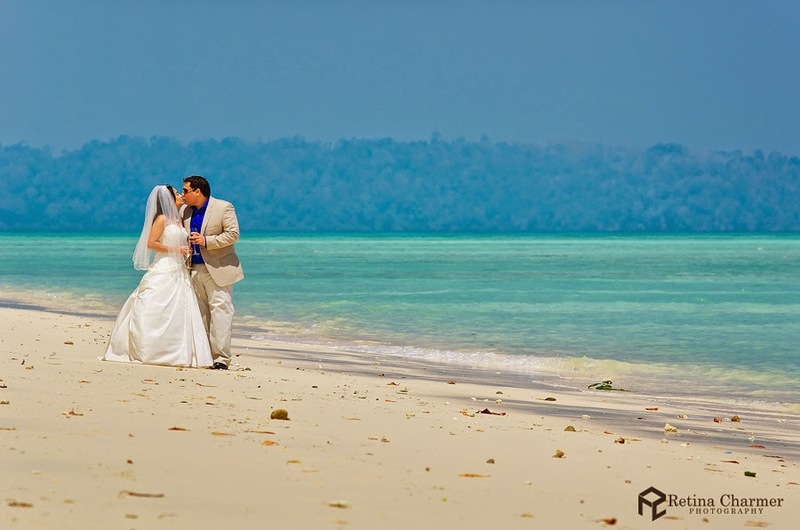 Andaman and Nicobar Islands, to be specific Havelock was their wedding destination. 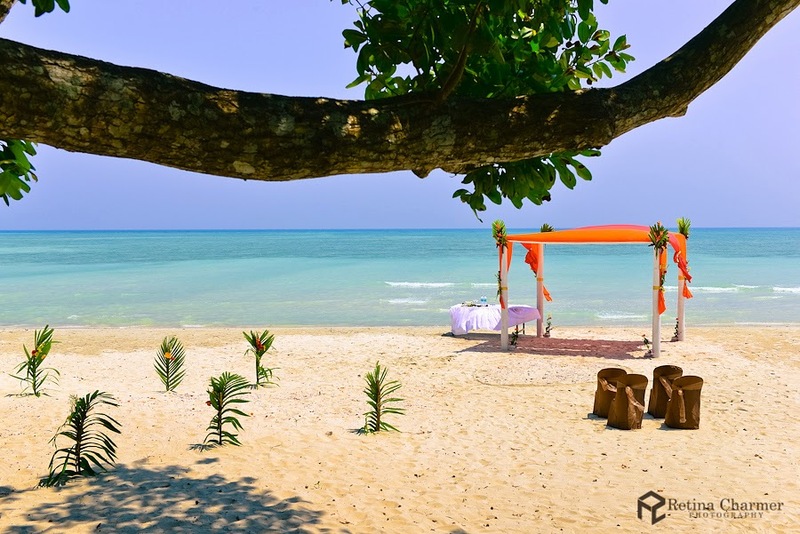 Such a unique place for a wedding, I love the very idea of getting married on an island and specially an island that is so exotic. Beauty of the ocean, the soft music of the waves.... true bliss (fact about me - I love beaches, I am crazy about beaches, I can while away hours and hours at a beach) I am so glad I was able to interview the couple. able to manage it very well). 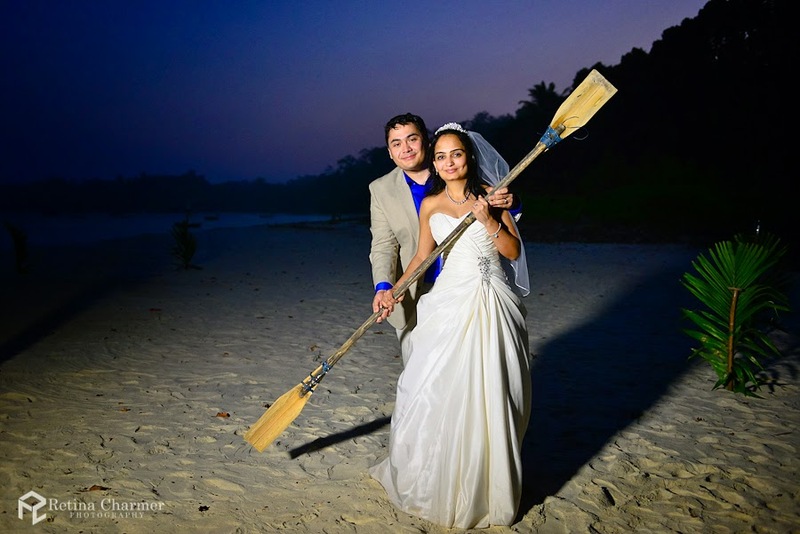 "Funnily enough it started with the resort providing a photographer, two weeks before the wedding we found out that they were just going to use one of their guys to take some photographs with some HD camera. Most probably we had better camera's than their HD camera's. 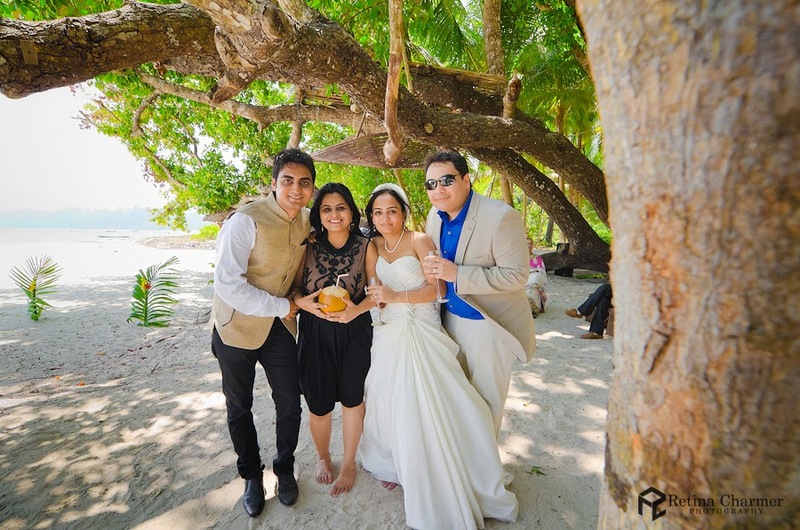 We started looking online and contacted a few photographers, Navin from Retina Charmer Wedding Atelier being one of them. We loved his work and his friendly personality and hired him to capture our wedding photographs and now he is the chosen photographer for our whole family for upcoming assignments too" (Tip: do not entrust important decisions to strangers, keenly supervise all the arrangements, either you can do it or take help from family members). All in all they had a great experience planning their wedding. 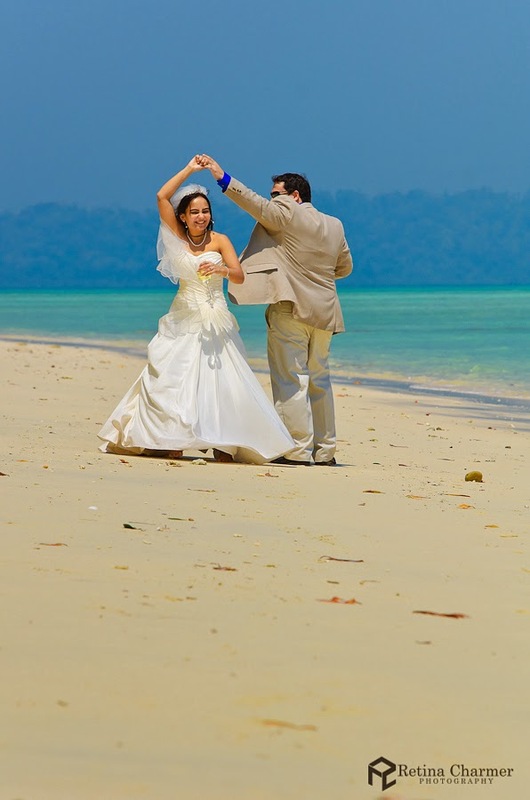 Marisha and Neil think that Andaman and Nicobar Islands are drop dead gorgeous and serene. They are extremely happy with their choice of the wedding venue and couldn't have asked for more. When I asked Navin what is his photography philosophy, he explains: My wedding photography is documentary in nature and is colorful, vibrant, dynamic and sometimes experimental too, capturing the special moments of the day while I highlight the cultural and ceremonial aspects makes each wedding unique. 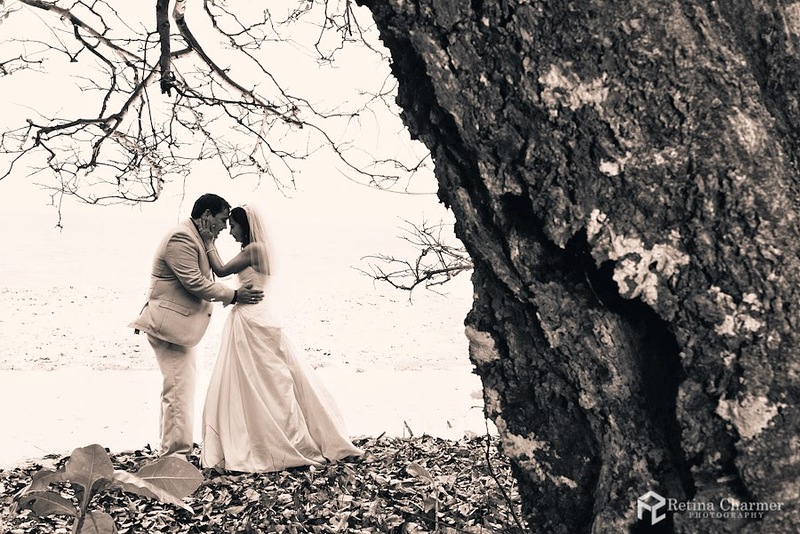 The experience of photographing someone’s wedding is very personal and depends on photographer’s ability to record the events for a lifetime of remembrance for himself as well as for the couple and their family. 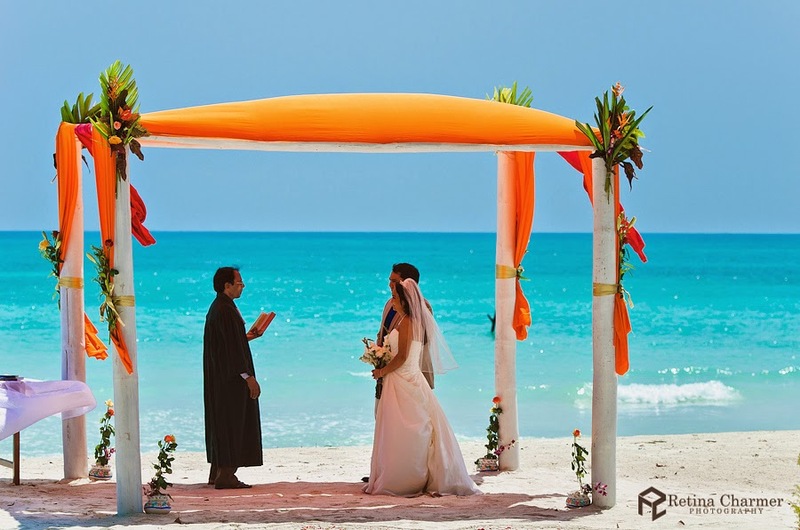 photographs from this particular wedding but if asked for the most favorite photograph then I would actually select this one as it personifies an uninterrupted moment of love with true essence of a beach wedding with a beautiful serene minimalist landscape. This one was shot when the bride & groom got done with their wedding vows they abruptly decided to take a long walk on the secluded beach. With their champagne glasses in their hands they walked for around 100 meters away from the venue. I stayed at the venue and kept following them through my camera’s viewfinder as I didn't want to disturb them even a bit, and there was this moment when they kissed each other and immediately Marisha took a beautiful swirl and that’s it, the shutter was released and this perfect moment was captured for a lifetime remembrance. 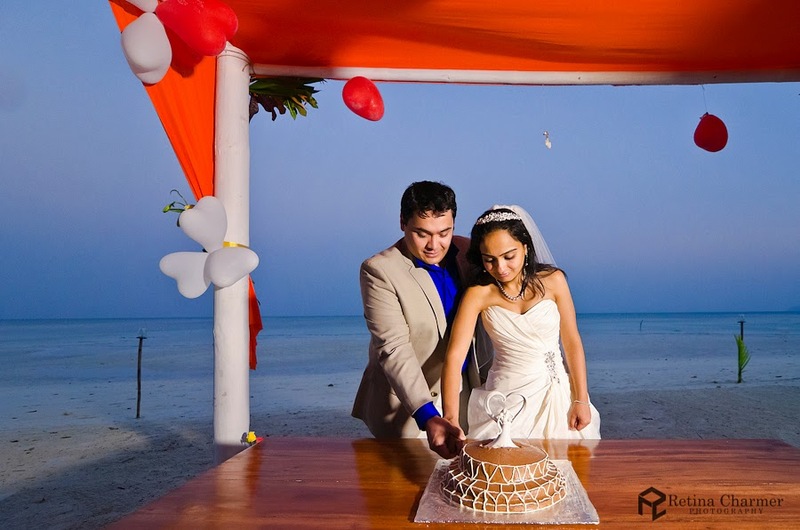 Balancing out this exposure to capture all the details in her amazing RK Bridal gown and the reflecting white sand against the darker turquoise backdrop was one of the toughest tasks too. 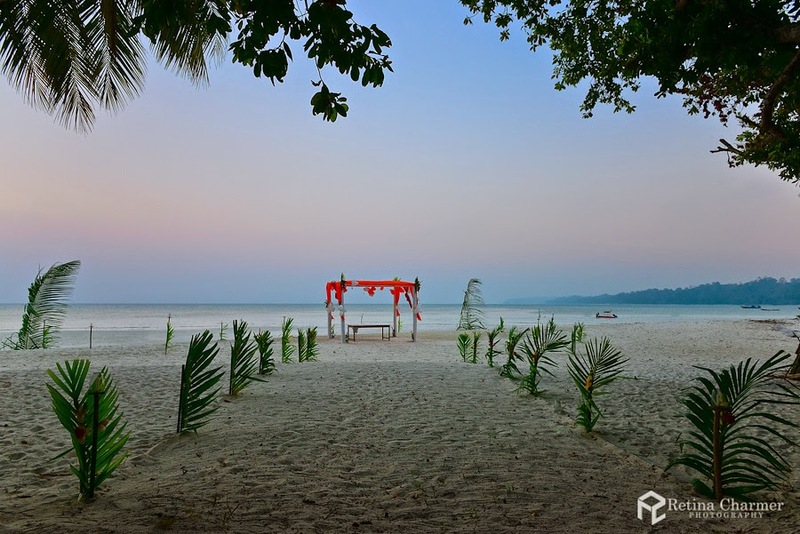 This photograph was captured with a Nikon 70-200 f/2.8 lens at 1/250 sec, f/5.6 ISO 100.
to shoot on Havelock Island because the beautiful unmanned landscape with its stretched white sand beaches were going to be the most important force which was going to motivate us all for the next 3 days. 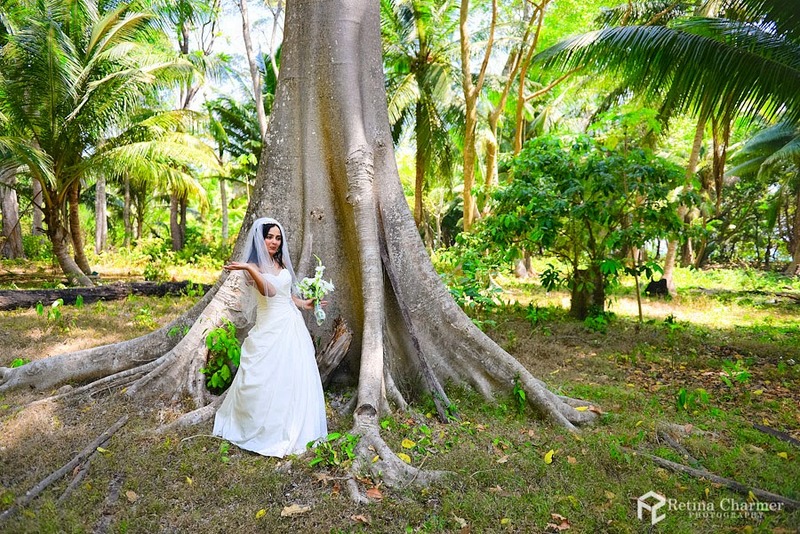 I would say that the uniqueness of Marisha & Neil’s wedding, my love for those Virgin Islands and my previous travel experiences altogether kept me inspired and motivated throughout the shoot. He ended the interview by wishing the couple: Wishing you LUCK, LOVE & HAPPINESS to last you TODAY, TOMORROW & forever after. Heartiest congratulations on your nuptial re-union. Thanks so much for the feature Snehal :-) This wedding is closest to my heart till date, would be hard for me to forget those memories which me and all the guests shared. Love the idea of an aisle lined with palm leaves. Very tropical feel and it stands out. And love the great tip about not trusting important details to strangers. Beautiful wedding!!! I have yet to plan a destination wedding but it's on my list. Beautiful! I love destination weddings and cannot wait to start planning more. Thanks for sharing! A beautiful intimate beach wedding, exactly what I will be going for! So glad you are back to blogging, I always love your couple stories. 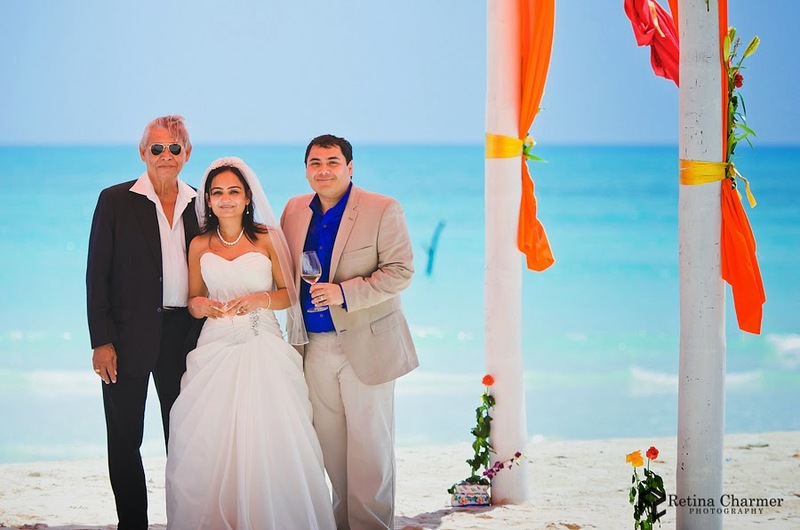 I love beach weddings & this one was definitely very beautiful! !